Turi Yoga - You are the key. Buddhist philosophy has referred to a place of uncertainty as the middle path. A place in which we do not have enough information to make a left or a right turn and we are ‘stuck’ in the middle ground, that is without a reference point. After many years of always deciding a left or a right, yes or no, good or bad, right or wrong, it can be very uncomfortable, even frightening, to be in a place without reference. When we find ourselves in this unfamiliar place of not-knowing, we may observe ourselves grasping at anything or anyone who may pull us from this space of being, to one of security and momentary elation. We often spend so much of our day, weeks, and lifetimes seeking this external satisfaction that when we are in a state of vulnerability, we will do anything to remove ourselves from its clutches. Perhaps instead of feeding this desperation to fix our sadness, or sorrow, or perhaps instead of fighting back against our uncertainty, we could begin to practice being with these sensations. Even though it may seem like agony, and against the sweet detachment from ourselves we have become accustomed to, allowing ourselves to tread water, and eventually float in the feeling of uncertainty, the middle path, could perhaps provide relief, and solace and clarity. Seeing our life and our thoughts as they are, life and thoughts, challenges, and learnings, feelings and sensations, helps one to be less caught in the trap of our habitual patterns and more comfortable with floating in the place when there is perhaps no light, or name or reference. In meditation and yoga we speak of finding this space between the thoughts, where words and judgments don’t exist, where with practice, we can begin to stay and float for periods of time, in the calm and emptiness, without conduction, or need, or reference. When you are facing uncertainty, practice breathing into your moment with kindness, and wrap yourself in the discomfort of being, no matter how long it promises to stay. Sit back and float in your river of confusion that with awareness, will only lead us back to ourselves. Corie Kielbiski works as a Holistic Nutritionist, Yoga and Meditation teacher at InspireHealth, a not-for-profit integrative cancer care centre. 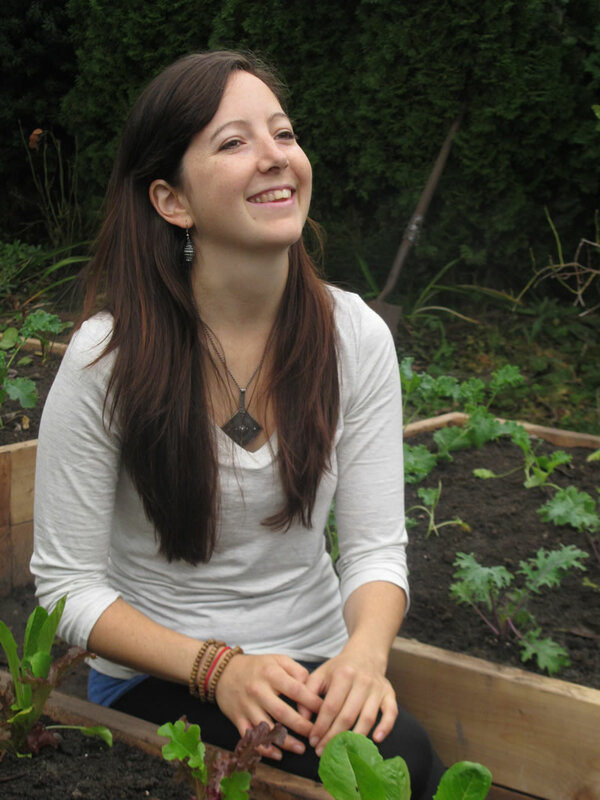 She has been teaching yoga and meditation for 7 years throughout Vancouver, Victoria and beyond and loves to share the connection of nutrition and well-being. Yoga Minutes with Troy is a 7-part series of short videos featuring Troy Turi. You can watch them here, or on Troy’s YouTube channel. Soulful expression. Non-political, uncompromising Spirituality and incredible credits. Every week a new jump into consciousness, raw and unbounded. A guide into how to be Beautiful. What authenticity and honesty looks like. The Unspoken, Spoken. Also as a bonus experience, the witnessing of how someone’s hair dries when coming in from a snowstorm. I was ambushed.. so I went with it. Accept the situation as it is right? There was once a squirrel. Thousands in fact. Though small, they ruled the roost of this small village called OGYA. They made Life’s priority to collect nuts. If you didn’t collect nuts, you were not allowed to play in their yearly games. One of the games was called WanderNuts. Even amongst squirrels the competition was fierce for who you knew and how to inflate your self Image simply came down to agreeing to collect nuts a certain way. .”You wanna come to… you wanna be sponsored by.. you wanna teach at..” It was important to be in the Squirrel’s high court of status. Or who were you…? The more nuts you had, the better you were amongst the other squirrels that lived to collect nuts. The better you were the more the Chief Squirrels would invite you to their yearly games and to their high status friends… where the Chief Squirrels could agree how important they all were. All wanted to be able to attend and all wanted to be the Chief. None of them knew initially that change was coming.. . such IS life.. because their spirituality of nuts didn’t prepare them for the Tiger amongst them. In the outskirts of OGYA, solitary, fierce, not squirrel fierce, fierce fierce, lived a tiger. He knew.. he was a tiger and could never be a squirrel. “Compete for nuts? I am a Tiger…” So he watched from behind his stripes… to discern what he was seeing; he saw squirrels give value to Nuts, sell the idea of its value and pretend that the world wasn’t just about living for Nuts, even while elbows were thrown and squirrels bought different brands of clothing but held the same agreed upon beliefs of collecting as they all strived to be in the Chief Squirrel’s favor… elbowing each other or agreeing with, whatever allowed them to be included into Chief Squirrel status. The squirrels that were different were not to be played with.. different how? They didn’t speak of nuts in spiritual terms and reflect on nuts via what past Chiefs said on nuts. Ultimately no nut power could negate the Presence that a Tiger had moved into their village… and as much as they left him alone, they were starting to change… everything was… because they couldn’t concentrate on their beliefs as easily… when the tiger began to venture into their circle uninvited. What did the tiger want? Each Urban Yoga Retreat is centered around relaxing the 3 vehicles we use to meet the world… the body, the mind, and your Soul/heart. This full day session will focus on You. Featuring 2 x 60 minute yoga classes, one outdoors ( weather permitting), 2 workshops, snacks, lunch and some fresh Juice Box Juices. You will refresh and take the space home with you. 4:00-4:30 — Discussions for the day and closing. Farzana Jaffer Jeraj is a multi-faceted gift of a healer. She runs her own company Clear Mind Hyponosis Inc, and is currently in the midst of completing her first book, “You can be Spiritual and not be Flakey.” Expect to feel the healing power of your subconscious though hypnosis,”How to cheat at Meditation” along with some sound work if time permits. This full day session will focus on YOU. 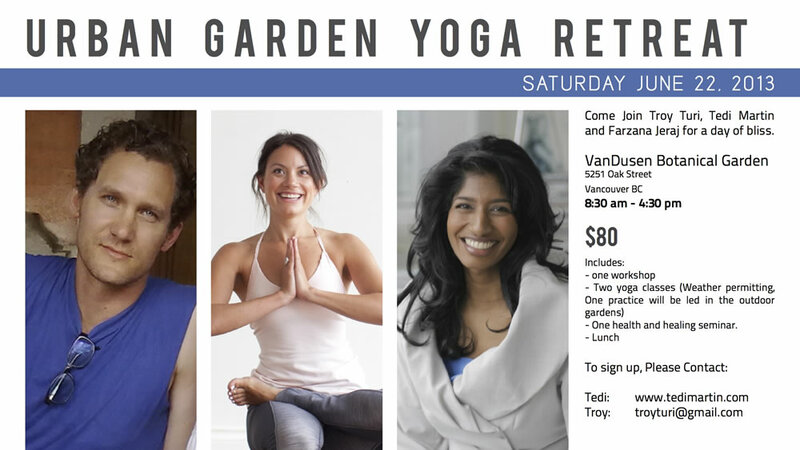 Featuring 2 x 60 minute yoga classes, a nutrition seminar, a powerful guided meditation workshop, and yummy snacks and green juice, you’ll leave feeling refreshed, renewed and more in tune with your mind, body, and heart. “Real” Yoga in Lov-ina, Indonesia. The Bemo (Bus) driver, Panca, was going the opposite direction of myself when he pulled to the side of the road where me, mySelf and my suitcase sat. I had been sitting for less than 5 minutes waiting for The Red Bemo bus to come sometime between 9-10am. It was Bali time, best to be early. I was sitting at 8 30. Panca had 3 passengers stuffed with goods and dead things in his rackety version of a mini-van, a testament to the kindness of Life that it still ran, it was probably made in the early 80’s. The 3 passengers ranged in age from a young, uniformed school girl to an elderly man of at least 75, who had a more fit body than myself at 40 and a very fit elderly woman. “Lovina. The other direction?” Panca pondered what this meant, looking in the direction my finger was pointing in. I had been given specific directions on how to catch a Bemo Bus to Lovina from the small town I was located in. I was told it may be a very difficult transport. I handed him the piece of paper I was given so he knew I was aware of my intention of getting there without having to get ripped off. On the paper it said, “3 different Bemo destinations, with 3 different colored buses all ranging in 3 different estimated prices for each trip, so I had a rough idea of the cost. The total for the experience would be somewhere around 85,000 Rupiahs. $8.80 Canadian. “I’ll take it.” I glanced back smiling deliciously at all of the other passengers. They all stared back with a look of horror. So we did. He told me it was 1km to drop them off, maybe kilometres in Bali are a different measurement because if 1km in Bali was more like 10km then that seemed much more like it. I waited to see if we would ever turn around and go in the direction that Lovina was actually in. After some time, sure enough, we did. There is a kindness present in how little death actually occurs in driving here, probably anywhere. One lane is used and on this one lane racing, helmetless drivers using scooters with newborns on board, motorbikes, monster Petroleum-filled trucks with the blackest exhaust and buses compete in a continuous game of Chicken… and you watch your living soul appreciate that you are still existing because the flow has to be just perfect for you or many to not get seriously hurt. Or killed. Seriously. A tourist friend that lives here later told me that in one day 9 people died on this stretch of road. That wasn’t including the accidents that also happened. To drive here is asking for your end, especially if you are not from around here. There is a flow that you must encompass to not get hurt. Even the children walking fearlessly on the road itself into traffic are a part of this flow; they think nothing of it. They inhabit it. In Thailand, the number one death in the country is coconuts falling on your head. The number two death is white people driving scooters when they have never driven them before. I was one of those people in Thailand. I saw the man with no face, just eyes, staring out. Or the other man who had lost his heel and had an empty stare very much like what I imagine women go through in birth. I spent 3 weeks having my back raked with a steel brush to clean the wound. It was a good day to die; even better, to still remain. Or to Stillness remain. So it wasn’t a difficult transport after all, in fact it was easy. It started and ended with accepting the situation as it is… I just had to risk all of who I was to receive the gift. Please give yourself a Nervous Breakdown! Inside, and during your yoga class, behind the curtain like the wizard in Oz, you are separate from what your body is doing but yet still driving the bus. People felt sorry for my grandma. She was a very unhappy mind for most of her 80 years. She blamed the world and everything in it for her lack of achievement. Her mind scolded her for not reaching what it thought she was capable of. Her incredible achievement of cooking love incarnate was wasted only on her family. Until… she got Alzheimers. This misunderstood gift. Life is kind. That is always the rule. Maybe you don’t understand kindness. But You do. So she lost her mind. Her family was hurt, she forgot who she was, who they were. She forgot how unhappy she was. Her misery dissolved. She became a smile without dentures. Nevermore beautiful and free of a mind that liked suffering. She left the planet without her teeth and found the glory of existing in each eternal breath. Yoga. Dying before she died, she was free. Do it, while you are alive. Die. The sooner. The better. So you’ve decided to retire as an actor and do something easier: teach yoga. How do you choose, which person or studio offers you the best opportunity for you to succeed in your new career path? There is no right way, only the way you choose. So choose wisely because they both have smiles and frowns. There are two choices before you get to the moment where the mat becomes your altar, whereby you hold the space to help show ‘students’ how to find their way back into their Self. Community is that place where everyone in it strives to help you move forward in your life—it should be a shared breath, a place where we practice together to find what we are looking for. Very often ‘community’ can be a watering hole where competition and insecurity vote with dollars and the latest trends in yoga nothing more then “Let’s all agree we are in the best yoga studio in the city, so the teachers must be the best also.” The big bucks you pay to join must validate the decision to practice there. Before deciding whether to take their teacher training or to know any community look at its inhabitants. In every major ‘yoga’ community in North America you can go to the city and find the studio that thinks of itself as the top of the yoga caste system. These types of students will find this place wherever they travel. It is the place where the people are ripped with muscles and the competition is to see each other’s bodies and tricks is paramount, and who can do the most limber variations of wrapping their feet around their heads three times while chanting in sanscrit. The breath is always a secondary goal in these classes. “Om” is very often replaced with “ouch.” Not all communities are this way, but most communities adhere to a “join ME” mentality. You all know what I’m referring to—or do you? But let’s be very clear. You don’t have to be that instructor. I say instructor because there is a big difference between a yoga instructor and a yoga teacher. You can teach in one of the prestige yoga studios in the cities and be the exception. Of course you can, so don’t let the above deter you. There are exceptional teachers teaching in these facilities. But they practice yoga as a way into peace not through a sutra or idea. You just have to seek them out. The bonus experience of taking your teacher training here though is that if you shine, it will take you a heartbeat to be emBEDded with a host of ‘followers’ that can make your life so much easier as a teacher. For the purpose of retreats or privates or even if you’re a musician, you want this since you can generate a following in two seconds. If a following is what you’re looking for, this is a really sound choice. The downside is these places tend to create a ‘style’ of teachers who talk yoga in a certain way—a brand creating a hierarchy and separation of themselves compared to others even while never saying this out loud. The teachers also must teach in this controlled environment rather than being steered to find and define their own relationship to yoga itself. Again, the teachers that come out of these “corporate communities” are in a really good situation in terms of coming out very well in the business of yoga based on the fact that the graduates are like a minor league system that does work to place them in a position in the company as soon as a spot opens up. You can’t beat that, can you? Maybe. The downside to this choice is most of the teachers that I have known who became a part of the various corporate communities at some point discovered that they were in one when they sought to express themselves and quickly found out the politics of being free is that it is not welcome, eventually realizing that the freedom is vitally important and they leave… to a smaller more intimate environment. Back to the teaching. The second path is frankly, harder, but maybe ultimately more rewarding. The second path is that of the outsider of the community, not because they don’t want to participate in it but don’t necessarily fit the mold. Try selling elderly yoga to your local ‘fit’ yoga studio. It’s the path where you change people’s lives by first changing your own. By thinking out of the box, by trusting that what’s inside of you is enough, by being patient while your cream rises to the top. When it does rise along the way, and people, teachers, students begin to validate you, you don’t get lost in their positive affirmations of who they think you are. You don’t become “important” as a teacher–instead you create a community whereby you help the others who are climbing up, the newbies find jobs, to inspire teachers to carry on if they really want this. Show them, that you are in this too, and that you have to work at not only getting better as a teacher but not trying to ever achieve being considered great, instead you find your greatness and let it be enough. You don’t want to fit in, you want to fit. This is the path where you do your 200 hours with someone who can help nurture your unique expression of yoga, to help you extract it and express it clearly, to give you the time to practice in an environment where while you’re learning to teach the others, you know that those others that you’re practicing teaching on are already your future students of the world and that by teaching them well you are now qualified to teach anywhere else in this world. No matter what the world says. This might cost you more money to have someone care that much for you. So like any good relationship… take your time. And ask as many QUESTions as you need to until you feel it–the spark that inspired you to want to teach in the first place. Whether it was the yoga itself or the teacher shining through what yoga is… don’t choose the style or the studio… choose your way. Or choose the studio and the style and find your way. Just because one is easier doesn’t make it the right way, but that’s for you to choose to decide. What’s your experience? How do you see it?